Question: I have a PP certificate. I have 46 hrs dual IFR training. I have 250hr total. My instructor is afraid to sign me off. I scored 98 on my written test based on a home study course I am a self learner and I needed a CFII for guidance. What can you recommend? I have too much invested in this guy. Point me in the right direction Please. Answer: First I would talk to the instructor. 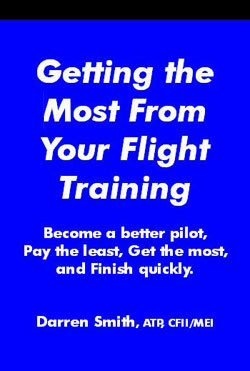 Call and schedule some non-flying time with him and ask him, "What does it take to get from right now to a checkride?" Make a list together. You may not agree with the items on the list, but its not the time to debate it. Right now, you only want to gather facts. With a curious mind, find out why each of those items are on the list. Were they things you have done incorrectly? Was your performance not consistent enough? There's nothing wrong with an open, honest dialogue with your instructor. Its natural for us to have some defensiveness when we hear things we dont like. If you can approach this discussion with humility and willingness to understand your instructor's concerns you will find the answers you need. The FARs say you need a minimum of 3 hours in preparation for the practical test. If you choose to go to another instructor, you would explain your situation and ask if he would be willing to do the 3 hours with you. After three hours, the new instructor will have a good understanding of your capabilities. If the new instructor is unwilling to sign you off, sit down and ask him, "What does it take to get from right now to a checkride." Make the same list. If you find similarities between the two lists, then you have confirmed a plan of action. What's the right amount of ground training? Do accelerated training programs work? I welcome you to ask aviation questions. If I don't know the answer, I'll find the answer and post it here. To those who have asked questions, thank you!